1/1, May 1930-2/3, August-September 1931. $3.00-$3.50 a year, 48-60 pp. This was the first of Pelley's metaphysical/political journals. It appeared at first only irregularly and its first editor, Margaret Christie embezzled the little money that was available and decamped with it. The journal promised "Master Articles, spiritual interpretations, and illumined correspondence on the present-day trend of social and religious tendencies," and unlike Pelley's later journals it did contain occasional articles and letters from people besides Pelley and advertisements by the likes of H. Spencer Lewis's AMORC, Frank B. Robinsons Psychiana, Edmund Shaftesbury's Ralston ventures, and Joseph Sieber Benner's Sun Publishing Company (publisher of The Impersonal Life, Elvis Presley's favorite book) that place the journal in the center of the occult / New Thought / Theosophical mixture of the time. By mid-1931, Pelley had floated a stock issue ("6 percent a year interest!") to raise money and for a period was published regularly. Pelley (1890-1965), was one of the numerous economic and social demagogues of the 1930s, on the left and on the right, who tried to fundamentally purify America of its flaws and lead it out of the Depression, but he was fundamentally a spiritualist ("The Dead Are Alive! "), moved and directed by his direct communication with discarnate entities on higher, light planes, and decidedly opposed to the fraudulent pretensions of what passed currently for spiritualism. Born in Massachusetts, he was the son of a Methodist preacher, a background that is reflected in his writings and in his staunch opposition to established Christianity. First-hand experience of the state of Russia immediately after the Revolution gave him a vivid hatred of Communism, although the economic theories and panaceas he later advocated were themselves largely socialist and collectivist in nature. While working as a screenwriter ("Mother's Madness: A Six Reel Comedy Drama of a Widow's Grit," etc.) in Southern California in May 1928 Pelley had a life-changing experience. As he later described it in "Seven Minutes in Eternity," with their Aftermath (New York, Robert Collier, Inc., c1929) he left his body and encountered two spirits in the astral spheres. These began to explain to him the eternal spiritual progression of all souls and their classification into hierarchies based on spiritual development. (Not surprisingly given Pelley's subsequent development, Jews and Blacks were revealed as the least spiritually developed and the enemies of the more developed souls on this earth.) Pelley elaborated these ideas and others received "'clairaudiently' via the Psychic Radio, from Great Souls who graduated out of this Three-Dimensional world into other areas of Time and Space" with concepts from Theosophy and other movements, especially reincarnation, Shamballa, past-life regression, automatic writing, pyramidology, "Silent Contact" with the Infinite, and the pivotal role of psychic development. The goal of man's existence in Pelley's view was "the revelation that each person in physical life, man or woman,is undergoing a schooling in practical experience to someday become a Christ over planetary systems as yet uncreated . . . ." He quickly gathered those attracted to his ideas into an informal "League of Liberation" or "Fraternity of the Liberatons" in California --"Not a New Religious Movement! It is sociological and humanitarian"--and then turned them to support his political ideas, especially the cause of cleansing America from the baleful influence of lesser entities, especially Jews. His Silver Shirts/Silver Legion recruited some 15,000 followers in the mid-1930s, and Pelley even ran for president in 1936--he was on the ballot in only one state, Washington, where he got 1,600 votes. America's entry into the War against Germany in 1941 marked the beginning of the end of Pelley's influence. In 1942 he was indicted in Indiana for sedition, convicted, and sentenced to 15 years in jail. On his release in 1950, he continued his spiritual work under the name Soulcraft (see the note under the Galilean), but was more restrained in propagating his political views. His spiritual ideas were influential in the "I Am" movement of Guy Ballard which recruited its early followers from Pelley's organizations. It is said that Pelley named after William Lloyd Garrison's Liberator, which seems unlikely even though in his last years Pelley acted as a medium for Garrison's spirit. NYPL microfilm; LOC. Washington, D.C.. Publisher: Published for the League of Christian Economists by the Galahad Press. Editor: William Dudley Pelley; O.E. Robinson, assistant editor. Corporate author: League of Christian Economists2/4, November 7-December 19, 1931. 32 pp., $6.00 a year. 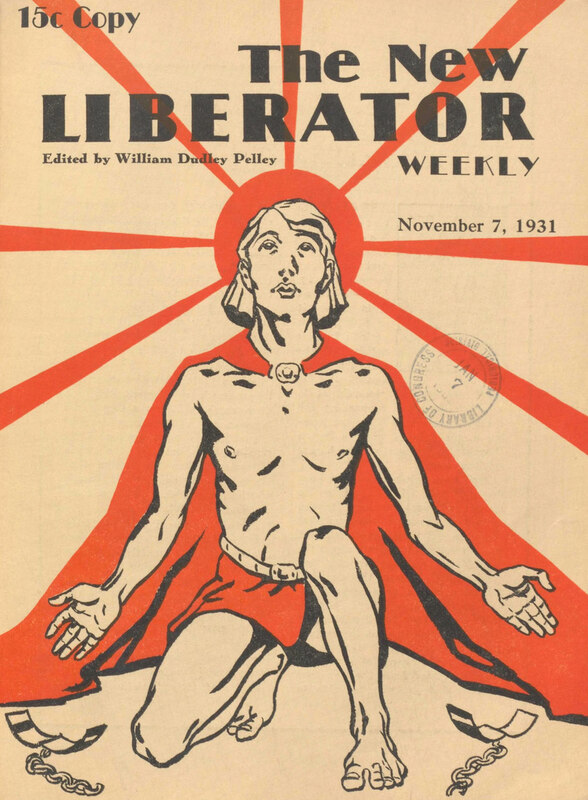 Continues the volume numbering of the monthly New Liberator. The journal's change to a weekly format coincided with Pelley's attempt to consolidate his League of Liberators and League of Christian Economists in Washington, D.D., changes transmitted to Pelley clairaudiently by the Higher Mentors. Like its predecessor, the journal consisted almost entirely of material Pelley had received psychically: "The contents of this magazine, unless otherwise designated, were obtained clairaudiently via the Psychic Radio from great souls who have graduated out of this three-dimensional world to other areas of time and space." The journal marks the first appearance in Pelley's published writings of "an evil conspiracy of Dark Souls" who plot against the dawning of the new age and whose machinations underlie current political events like the Hunger Strike in Washington and the turmoil in the Far East. NYPL; Columbia University; University of Kansas; LOC. Materials generously donated by Erik Mona.